Griffith Land & Cattle Co. Recently updated on 17 April 2019. Be sure to scroll all the way down this page. Patterdale Rescue ?! ?<<< Click n see here. Pups from the our kennels Are-NOT Available at present. When that changes we'll mention it here. Things have changed a little. We expect to have one or two pups available in a month or so. Stay Tuned. Pups from the Nemesis Breeding program are $500. All pups are given appropriate shots and are wormed regularly. That's how it usually goes when there are no complications. The settling-in process for the Nemesis Project's new location is progressing slowly and it'll prob'ly be a couple years before we can say we've really gotten back into the swing of things. Contact Us <<< Click here to see our contact information. BUT...... Please don't email us asking if we have pups available. The answer to that question is always shown at the top of this page & kept current. Remember, some of the folks on our >>> Friends n Photos <<< page sometimes have pups. They and all the breeders shown on our Links page produce the real thing. Check 'em out. Whenever we have pups available to the public we ask a price that offers some assurance that the pup or dog will get decent treatment. That's our main concern. Some of my customers tell me some other breeders are charging closer to $1000 for pups. I say, good for them! Remember, a particular color or "look" is-not what makes the dog a Patterdale Terrier. The "show-dog" crowd likes black or chocolate colored dogs only. 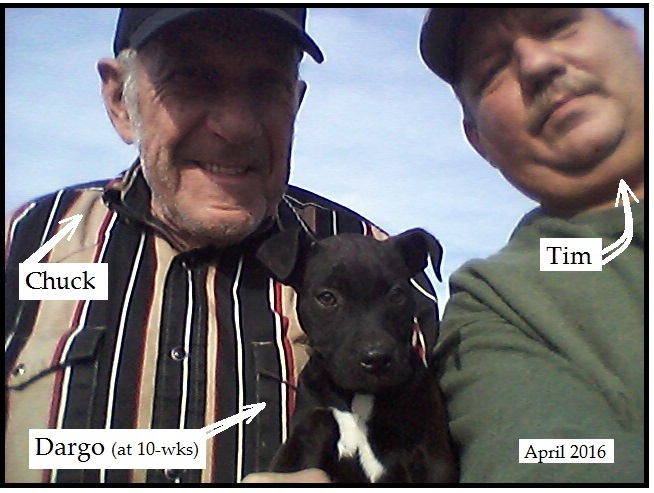 Working Patterdale Terriers are NOT bred for their colors or their looks. Even so, we do get some pretty dogs from this family. If there were a color-coded genetic link for performance, whatever that color was would be our favorite! Be sure to examine our Colors & Markings page to get your mind right about "looks." We take pictures all the time and if they're of "decent" quality [most aren't] we include them somewhere on our site. We sometimes get photos sent to us from other Patterdale folks. When the picture is of decent quality and of an informative subject we'll try to find a place for it somewhere. Be sure you understand that you can never tell what size a young puppy will grow to. Click here to see >>> Pinga's page. <<< (meh heh heh) Pinga was a monster as Patterdales go but he sired Bosco, a normal size "spannable" dog. The finished size of a Patterdale Terrier is always a wait-n-see proposition. We don't breed them for size. We breed 'em for work and whatever they get a-hold of is usually doomed. Folks, we think our price ($500) is stiff enough to keep the "riff-raff" from bothering us and people generally take better care of dogs when they've paid a decent price for them. Cheap dogs seem to get cheap care, a sad end for these special little dogs. Remember: All costs associated with delivering the pup to your hands are additional to the purchase price. In recent months we've gotten several inquiries from folks in other countries. For this reason we are beginning to explore the idea of exporting outside of America. More on this as it develops. It might happen some day. Remember, if you've just gotta have a Patterdale Terrier, be sure you have a place for it. If it's not gonna be a "house-dog" you'll need a safe place to keep it. If you have doubts, take a look at the Alcatraz Kennels page for some good ideas. Click here >>> Alcatraz Kennels for a look. This address is the local Lowe's Store which is about 30-minutes from our place. There is also a Super Walmart and other stores on the other side of the street. Both places have nice big parking lots. Remember, a hound hauler DOES NOT go straight from the pick-up location to the drop-off location. They have a route that they generally follow, making pick-ups and drop-offs along the way. Your dog's trip could take a week or more. We've all heard ugly rumors of some hound haulers but don't have any personal knowledge or experience of such things. Dog hauling requires a lot from the driver and puppies are significantly more work and worry than grown dogs. Most of these guys take much better care of the dogs [generally] than any airline. Airlines all treat your dog like common luggage. He's been hauling dogs for over 20 years and he covers the entire country. Chuck hauled this puppy to Wyoming. It's a nail-biting wait for the customer but the pup gets lots of personal attention on the way. We like this guy and think of him first for coast-to-coast hauling. The one-and-only hitch in the plan is that it sometimes take's awhile for the dog to arrive because his route is so convoluted. He carries lots & lots of dogs, mostly hunting hounds of one kind or another. It can take up to 3-weeks to cross the nation. I also know of a guy that hauls dogs for folks though his range is currently just the "eastern half" of the country. He moved a dog for us to a customer in eastern Texas some time ago. The customer is who put me on to him and it seemed a good experience and we think he's okay.